You are here: Home » » It’s that time again. ‘The Way’ is now out on DVD so that would make a nice stocking filler……. Of course that got Teresa and I talking about the next stage of the Camino and it was on Dec 31st last year that we sat and planned this year’s section over coffee and mans in Stanfords…… got to get planning. Teresa and I met when I was training a group of wonderful women to get fit to walk a 60 km walk through London over 2 days in September 2006. Teresa became a team member. The walk was to raise money for Breakthrough to Breast Cancer and 16 of us trained, built a great bond and walked together in great style. After the walk, a core of women wanted to continue so the East End Girls team became a women only walking group called the East End Girls and we have been walking at least once a month since then. 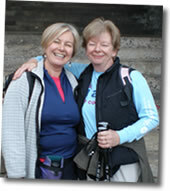 During one of our walks, Teresa and I discovered our wish to walk the Camino de Santiago de Compostella. Because of lifestyle, we were unable to do it in one fell swoop so we researched and decided to start in Le Puy en Velay in Central France and take as long as it took to reach Santiago, a distance of over 1000 miles. Our first section was undertaken in October 2008 and since that we've visited once a year. Our wish is to do two sections a year so we're working on that. En route, we laugh, talk,enjoy the magnificent scenery, put the world to rights and love these days of escape that allow us to be two wonderful women together. Camino 2013, here we come. Heather on This time tomorrow….